Orange County in New York's Hudson Valley is a great destination as a day trip from NYC or as an overnight trip to dig deep into the regions many offerings. Orange County is home to many historical sites and institutions including many American Revolutionary War locations. The West Point Military Academy rests on the shores of the Hudson River in Orange County and offers tours of the campus. Woodbury Commons retail outlet is a truly notable shopping locations because of the high-end nature of many of its shops. The Sugarloaf Craft Village and the Storm King Art Center are both great venues for those with an interest in arts and crafts. Hill Hold, Brick House and Crawford House are among the famous historic homes in the county. Orange County is also home to the Motorcyclepedia Museum with hundreds of vintage through modern motorcycles on display and Orange County Choppers made famous by the TV show of the same name. The Culinary Institute of America is also in the county and a great stop to take a tour or have a meal. Fort Putnam, Fort Constitution, Fort Montgomery are all Revolutionary War sites and points of interest in the county. 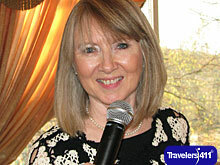 Susan Hawvermale, Director was on the July 5, 2014 "Travelers411" Radio Show in hour 3. Susan Hawvermale has been Director of Orange County Tourism since 1992. She is currently president of Hudson Valley Tourism, Inc, the "I LOVE NEW YORK" regional tourism promotion agency that spans ten counties. Explore Orange County with Susan Hawvermale, Director of Orange County Toursim and find out about some of the fun things to do and places to explore including everything from historic sites to motorcycle museums. Susan Hawvermale was also on the June 22, 2014 "Travel with Stephanie Abrams!" Radio Show in hour 3.